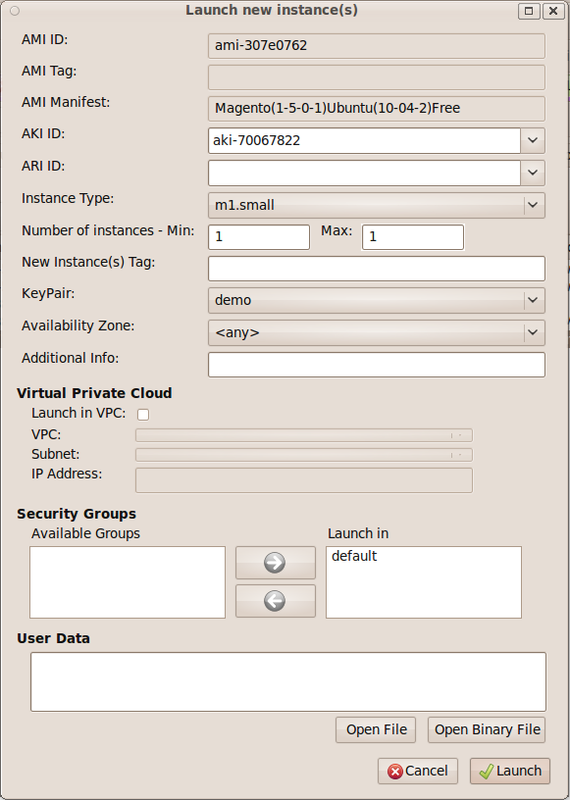 The autoinstall scripts now support the creation of this instance within a VPC, which is the new Amazon default. Before this, the hostname was being set incorrectly within the database unless you'd associated an Elastic IP address with it. Although an impressively featured e-Commerce platform, Magento is extremely hard on the platform that it runs upon, making very heavy use of the database in particular. As such, it is best not to use shared hosting, where there are usually hundreds of websites running on a single server, but to run it on your own server instead. One simple way to do this is to grab yourself an account on Amazon Web Services ( http://aws.amazon.com ) and set yourself up with a virtual server to run it. As Magento runs best on a LEMP ( Linux / Nginx / MySQL / PHP ) platform, this may require skills outside those that an e-shopkeeper would ever be expected to posess. To address this, we decided that it would be a good idea to make it as simple as possible by creating an image that you can start up and run with a single click ( well, almost! ). Before you get started, it's a good idea to set your Amazon account up ready so that you can see your site once it's up and running. It saves a lot of back and forth between different screens, and ensures the install runs smoothly. By default, this firewall blocks the outside world from seeing your instance. To ensure that we have all the basic abilities of the site available, you need to click on the “Security Groups” tab, and highlight the 'default group in the left column by clicking on it ( if it's the only group, then it will already be highlit ). NOTE: this example opens up the firewall to everyone. This may well not be what you require!! Note the 'network' radio button is pressed, and the 0.0.0.0/0 value added. This is 'everyone'. There are alternatives from just you all the way up to everyone, but describing them is outside the scope of this document. 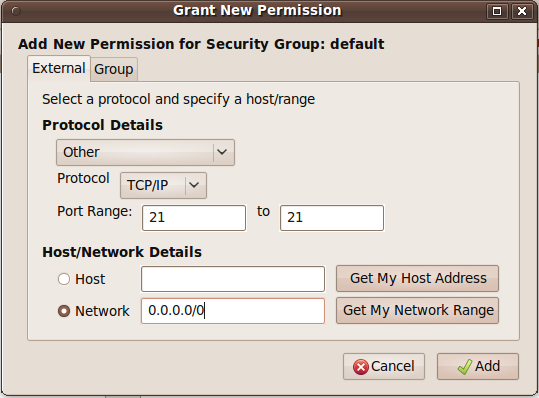 To enable ftp ( including passive ftp, which is used by default with clients such as “FileZilla” ), you need to enable 2 sets of permissions. Note this is made intentionally difficult as ftp is inherently insecure as it passes login credentials in clear text across the internet. 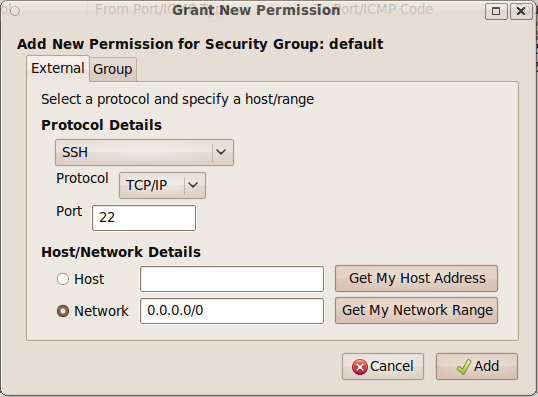 If possible look at using sftp ( which uses the ssh port opened above ) instead. We currently have Images available in ap-southeast-1 and us-east-1 that are ready to go ap-southeast-1 is getting a bit out of date as I've not received much interest at all, so look in US-East-1 ( as of 1/1/2012 the current image is ami-5d975634 for Magento 1.5.1.0, ami-3117d558 for 1.6.0.0, and ami-1518cc7c for 1.6.1.0 ). However, I'll use Singapore as the example as there are less matches to confuse the images. Here, our image Is ami-307e0762, last on the list - identified by our catchy ID of 859714128294. Click on the entry to highlight the row, then right click and select the “Launch” option from the menu that appears. In the new window that appears, you only need to select the instance type ( we recommend s1.small if you're just getting familiar or setting up a small shop, or m1.medium if you need something larger ), and a keypair ( if you have none, click cancel, then use the “KeyPair” tab to the right of “Images” to create one – make sure you don't lose the accompanying file! - and then repeat the above process ), then hit “Launch”. 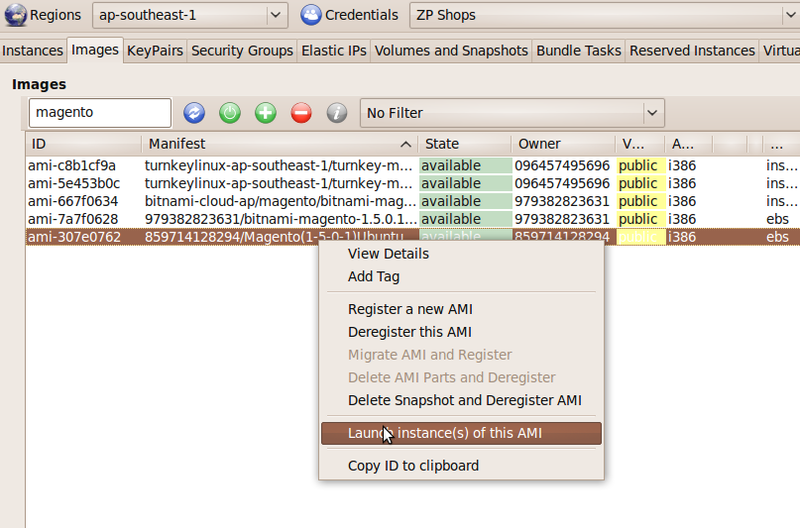 The View Details window will allow you to highlight and copy the 'Public DNS Name'. Next stop is to paste that hostname this into your browser, as the front page provides you with all of the account details that you need to connect to the server, along with general details for this AMI. Sit back and enjoy Magento! Ok, now that the server is up and running, here's a bit more of a detailed description of the server you're running. I have chosen The latest Ubuntu LTS Linux server to run this image on. This is for a number of reasons, the important ones being that it's fully supported until April 2015, and that stability is immensely important for any server platform. It's also pretty mature now, but also uses pretty up-to-date versions of the required toolset – Apache 2.2.14 and PHP 5.3.2 being the most important from a security point of view. Mysql 5.1 is important too, behind the scenes. On top of that, we've installed the latest version of the Webmin dashboard to simplify administration. Because of the heavy use that Magento makes of the database, I've installed a non-standard version of APC – the alternative PHP Cacher – as the standard one dumps horrible error messages into the logs, enough to scare anyone! The product makes an enormous difference to the performance of the server as a whole. I've also reconfigured the MySQL server from standard, to make much better use of the available memory, providing a major performance improvement. 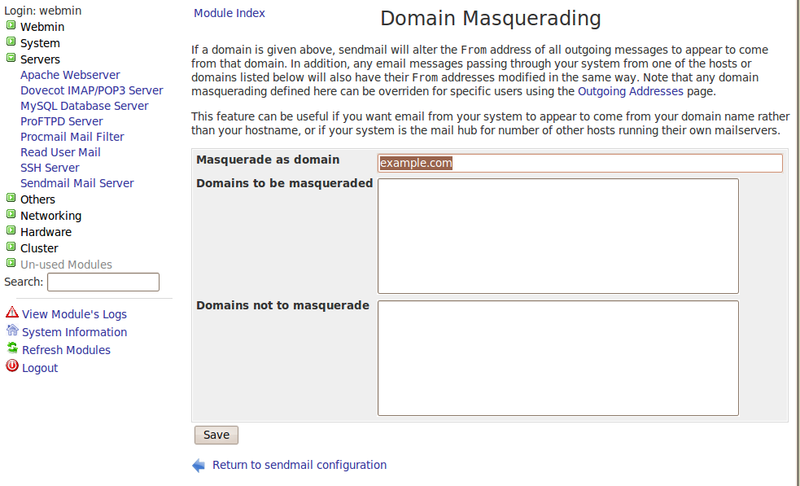 I have also installed, but not configured a fully featured mail server. More on this later. If you're intending to use this AMI in production, then there are a few wrinkles that you need to know, and some stuff needs to be disabled. The ftp server, proftpd, needs to know the external IP address of the server, and it needs to be coded into the config file. Because of this, every time you reboot the server, the script /usr/local/bin/FixProftpdMasq.sh is run – called from the file /etc/rc.local This does no harm, and can be left in place. /usr/local/bin/FixBaseURL.sh is also run on bootup. 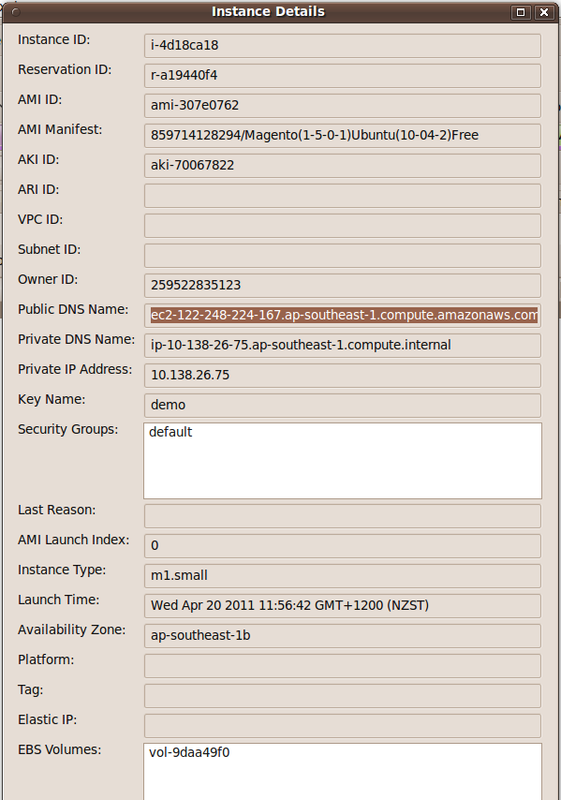 This reconfigures the magento database to use the “Public DNS Name” ( eg http://ec2-122-248-224-167.ap-southeast-1.compute.amazonaws.com/ ) above. This is more significant, as it always uses this value, even if you've reset it to your own domain – eg http://www.example.com/ - which can be frustrating! Once you've changed this ( using the Magento backend configuration menus, followed by a cache refresh ), this script needs to be disabled. The easiest way is to comment out the line. in /etc/rc.local by adding a '#' at the beginning of the line ( webmin->others->file manager if you're not familiar with editing system files in linux ). Note: the easiest way to get magento working again after an IP address change ( eg assigning an Elastic IP address ) is to reboot it, and this script will kick in. and you then use sudo to run anything that requires heightened access rights. There are two aspects to be addressed here. Firstly, change all of the passwords as soon as possible. The default ones are in the public domain, so there will be enough people out there trying to hack in, and abure your server. This is especially important ( ie more than monetary cost – you pay for your bandwidth after all ) once you have sensitive information on your server. (New) We have added a couple of custom commands to the Webmin interface so that it is a simple matter to provide 'under the hood' access to Green Gecko Global Ltd if you should require it. Start up the Webmin interface on https://server.name:10000 and Open up the 'Others' Menu block on the LHS. Click on custom commands. 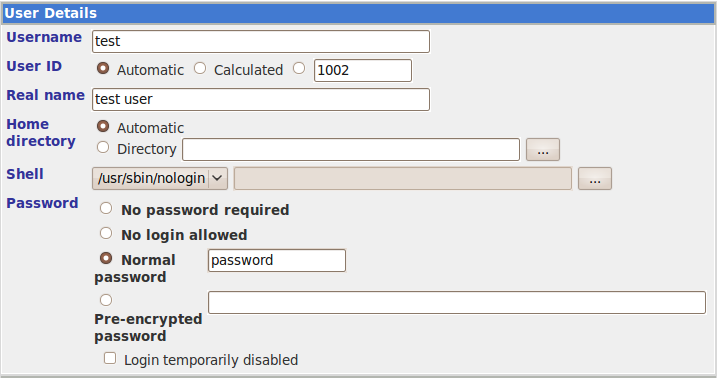 From there, you can select either the Enable or Disable access buttons. Here's the success message. Green Gecko Global ltd can now get in and work on your server. Here's the success message. Green Gecko Global ltd can no longer get in and work on your server. Unfortunately, sending mail from an Amazon server is unlikely to be reliable, as so many of them have been marked as sending spam in a previous life – many of the major players just delete it as a matter of course. There are ways to get around it ( a common one is to send via a google account – the raw bones of the method is described at http://serverfault.com/questions/90161/how-to-configure-sendmail-to-send... ), but that's a bit outside the scope of this document. The mail server installed is sendmail, and we've preconfigured it to use greylisting ( ask incoming email to come back in half an hour if you don't know them ), Realtime Blackhole Listing at spamhaus.org ( drops mail from known spammers ), and malware protection provided by clamav. First time that you log in to Webmin, select the “refresh modules” option, near the bottom of the menu on the left-hand side. Then install any package updates ( if there are any, use the hyperlink on the last line of the welcome screen ). Before setting up email accounts, you'll need to add some mail users to the server. Select “users and groups” from the System menu on the left hand side. The important parts of the 'create user' form are in the User Details section, where the Username, Real Name, Shell and Password need to be changed. Then hit the 'Create' button at the foot of the page. 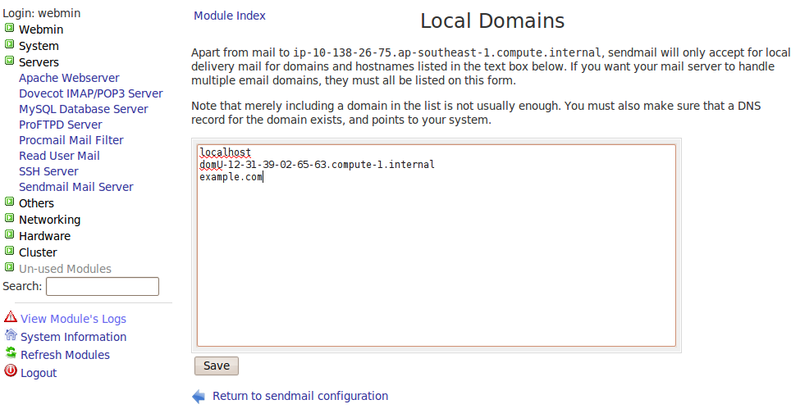 First, ensure your domain is a Local Domain ( ie the server is configured to accept incoming mail for example.com ). Click on the icon, and add then click on save. 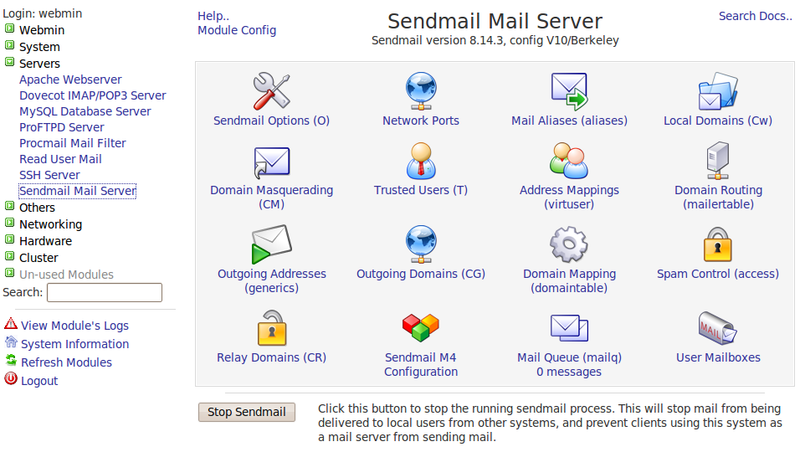 Once you've added all of the email addresses and users, you need to restart sendmail, using the stop and start sendmail buttons at the base of the Sendmail Mail Server main configuration page ( start button appears once you've stopped it ). That's the server configured. However, there are a few other things that need to be done. 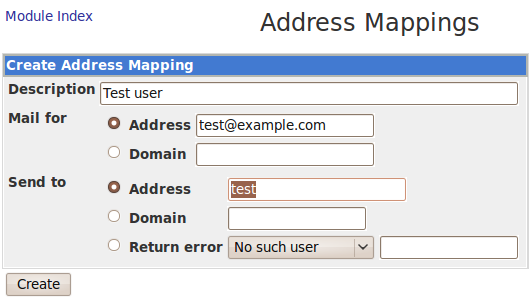 Open ports 25, 110 and 143 in the Amazon firewall using the method described above ( options SMTP, POP3 and IMAP from the dropdown list ). Add a CNAME ( eg mail.example.com ) for your users to connect their email clients to. 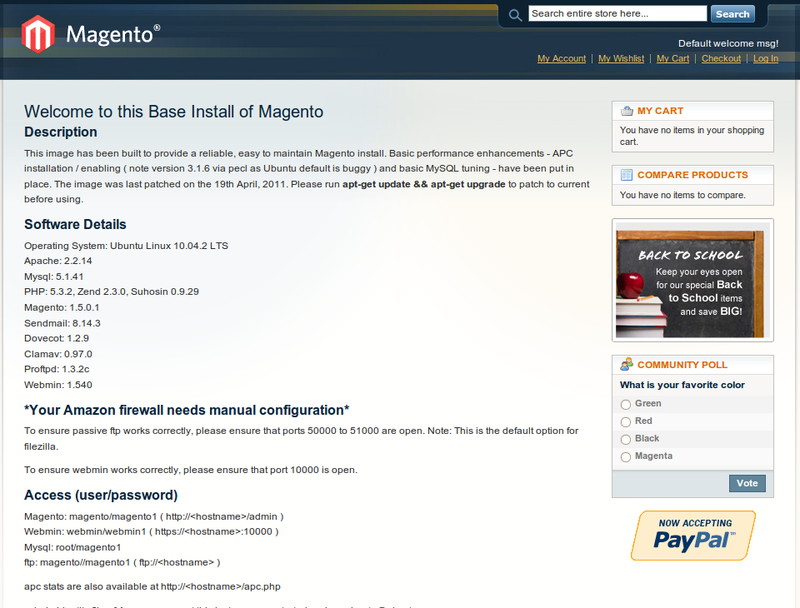 Well, if you've got this far, then you should have a functioning Magento site, supported by a secure mail server.